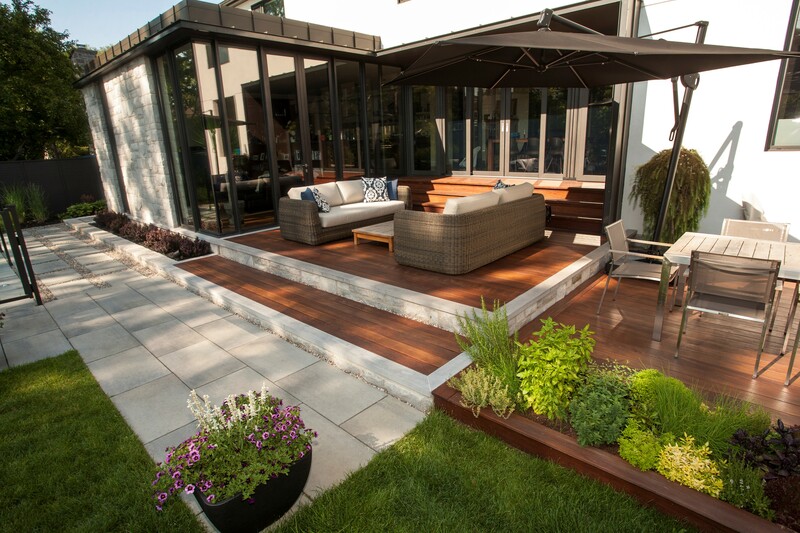 This contemporary landscape was conceived by our landscape architect, Ellen Rasnikoff, to compliment both the interior and exterior of this beautiful T.M.R. home. 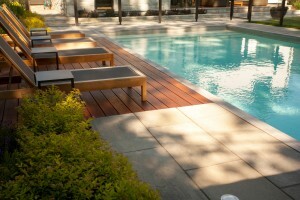 IPE wood was used to add a warm texture on the upper patio and the sundeck surrounding the pool. 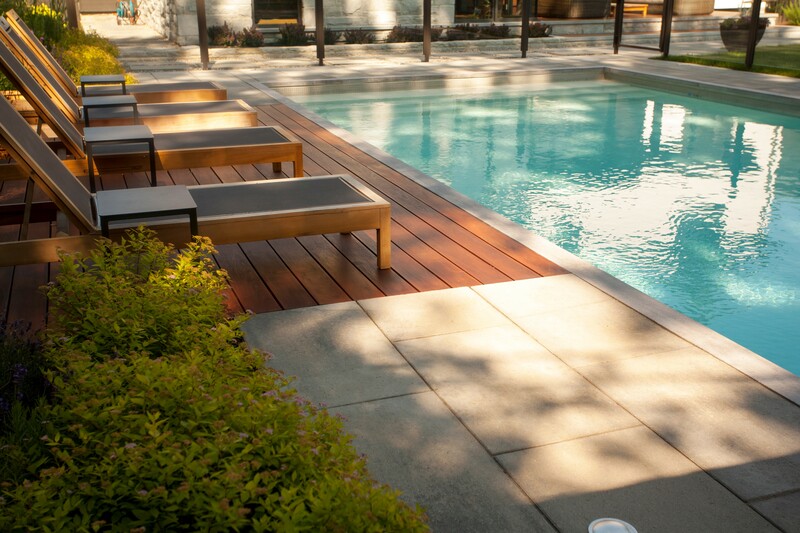 This wood does not rot and withstands our harsh winter conditions. The pool itself was positioned to one side of the property to help conserve a large existing tree and allow this family of five enjoy a children’s play area! The clients wanted an herb and vegetable garden, we were able to incorporate one into the patio that adds a sense of family to the landscape. 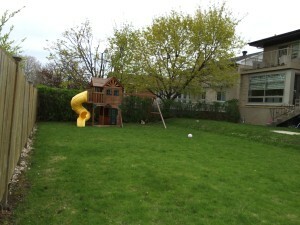 This is a small but significant addition to any family backyard! 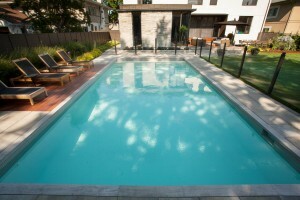 The paver of choice in this backyard was Techo-Bloc’s Blu Grande, the walls are Blue Ciel natural stone, and the pool is caped with St-Marc Limetstone. 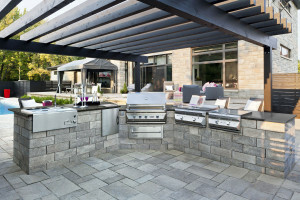 Whether the outdoor space is used for an intimate dinner party for 4 or a garden party for 40, this backyard will undoubtedly impress the guests! 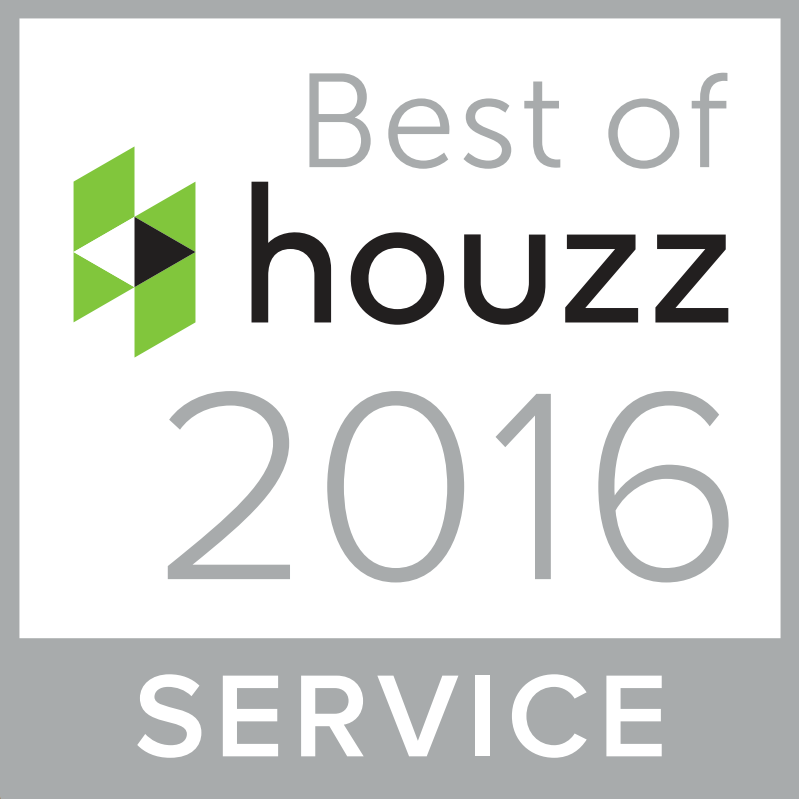 Groupe Paramount is proud to have won the Houzz 2016 badge for great service! We thank our clients for taking the time to post positive reviews, this is how we got this badge! 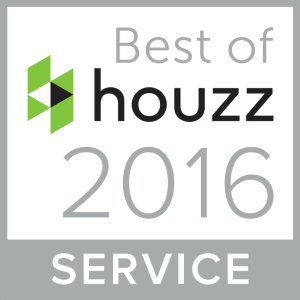 The one thing that sets our company apart from the other pool and landscaping companies is that we can provide turnkey service. 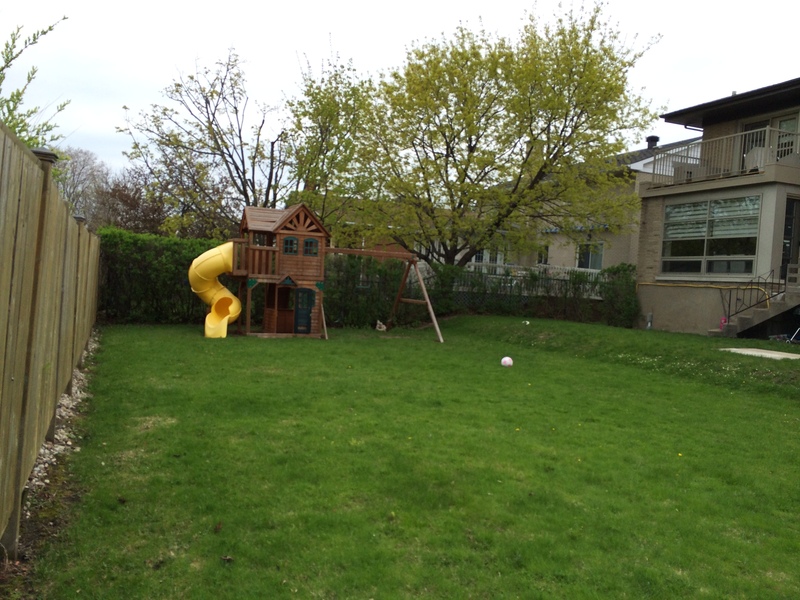 This Île-Perrot project is just one example of this service. The family wanted a resort right in their backyard! There are many elements that make up this oasis, including the pool with it’s water curtain feature, the sunken fire pit that seats 20 comfortably, the cabana that provides shelter and a beautiful twilight atmosphere, the fully equipped outdoor kitchen, the terraces that surround the pool and the plantings that give this outdoor space the finishing touch! All beautiful and all came together to keep this family and their friends entertained. This property was featured in the 2014 Techo-Bloc catalog. This beautiful Baie d’Urfé home is surrounded by nature that provides total privacy for the backyard. 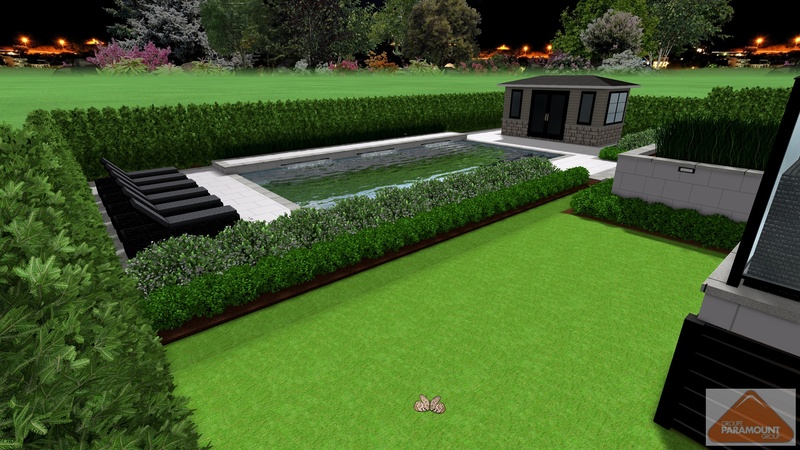 In order to soften the look of the extra large pool, we built a planter around the perimeter of the pool and planted boxwoods placed at the pools edge, creating a haven for swimmers. The sleek main pool is 20′ by 65′ and there are steps that lead up to a 20′ by 20′ sun deck which is enjoyed by adults and toddlers alike. A spillover was built into the pool which not only looks beautiful but also provides the sound of rushing water which is so relaxing! 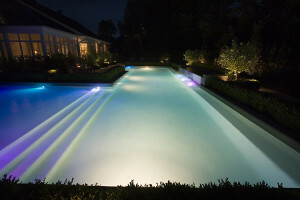 At night the pool turn s into a twilight oasis, with gorgeous coloured lights that brighten up the water and highlights this amazing pool. The pool and landscaping at this home were designed to be in harmony with it’s natural surroundings.